Starting with v16.2.0.x, if you reference Syncfusion assemblies from trial setup or from the NuGet feed, you also have to include a license key in your projects. Please refer to this link to know about registering Syncfusion license key in your ASP.NET Core application to use our components. 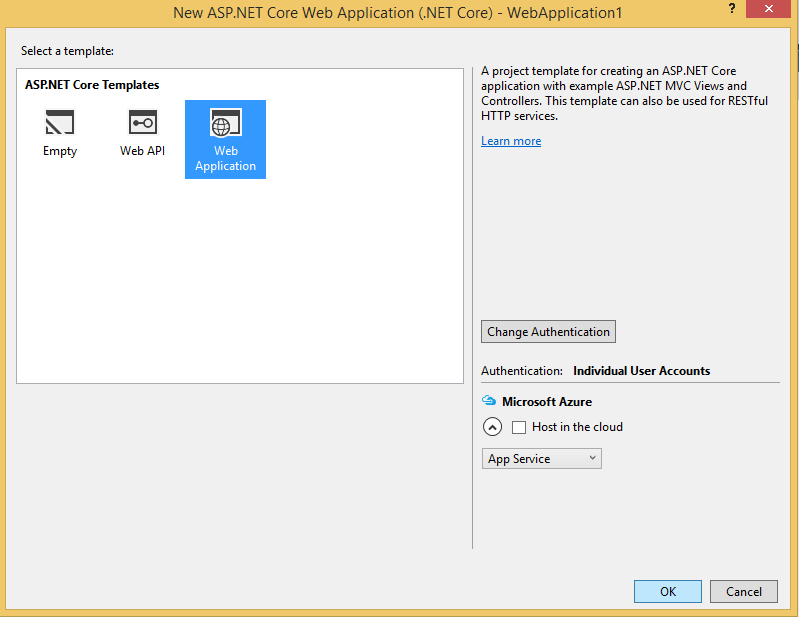 The following steps helps to create a ASP.NET Core web application to configure our components. 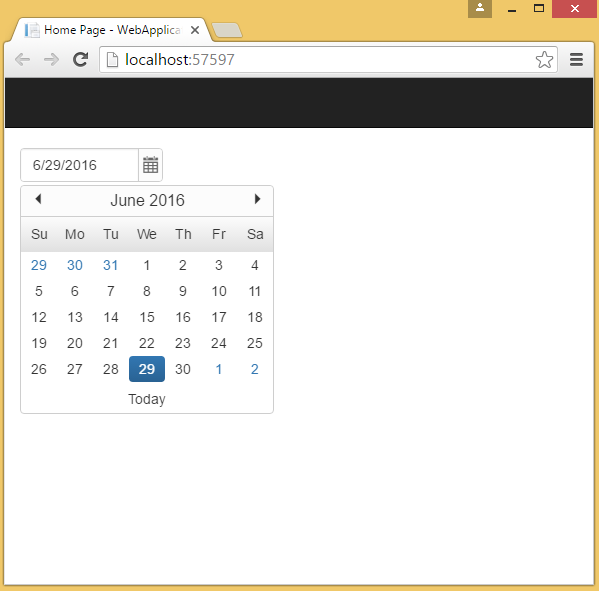 Open Visual Studio 2015 to create ASP.NET Core web application. 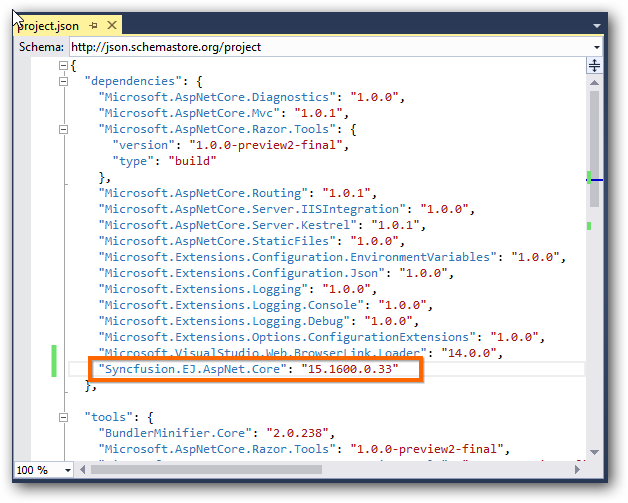 After project creation, open your project.json file to add our Syncfusion assembly packages. The ASP.NET Core NuGet packages versioning has been streamlined as 16.1.0.32 in shorter than older versioning (16.1600.0.32) from Volume 1, 2018 service pack 1 release (16.1.0.32). Since all the framework version wise assemblies are grouped into a single package. 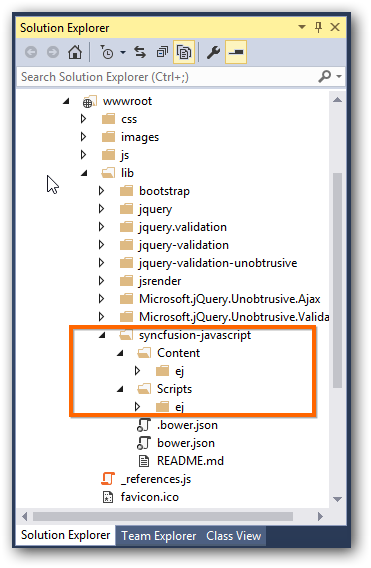 The package “Syncfusion.EJ.MVC” renamed into “Syncfusion.EJ.AspNet.Core” from Volume 3, 2016 (14.3.0.49) release. The “preview2-final” keyword removed our Syncfusion packages naming from Volume 1, 2017 (15.1.0.33) release. In the Solution Explorer window, click the “Show All Files” button. Open bower.json file to include the following necessary packages. Now open _viewImports.cshtml file from the views folder and add the following namespace for components references and Tag Helper support. Include the below mentioned scripts and CSS references under the appropriate environment. (For eg: If your environment is “Development”, then refer the scripts and CSS files under the tag environment names=”Development”). Refer all the required external and internal scripts only once in the page with proper order. Refer this link to know about order of script reference. Add ScriptManager to the bottom of the layout.cshtml page. The ScriptManager used to place our control initialization script in the page. Now open your view page to render our Syncfusion components in Tag Helper syntax. Finally compile your project, after successful compilation then press F5 key to deploy your project. 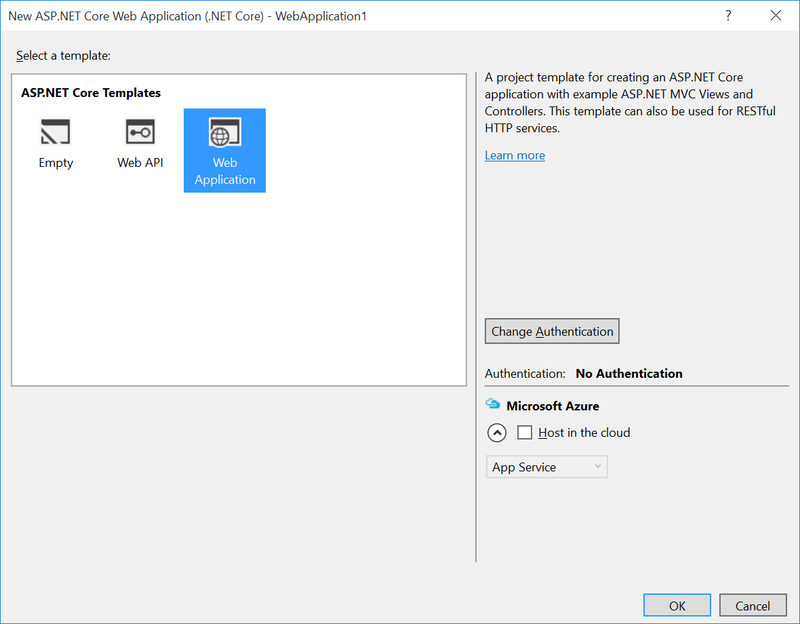 The following steps helps to create a ASP.NET Core web application to configure our File Format components. 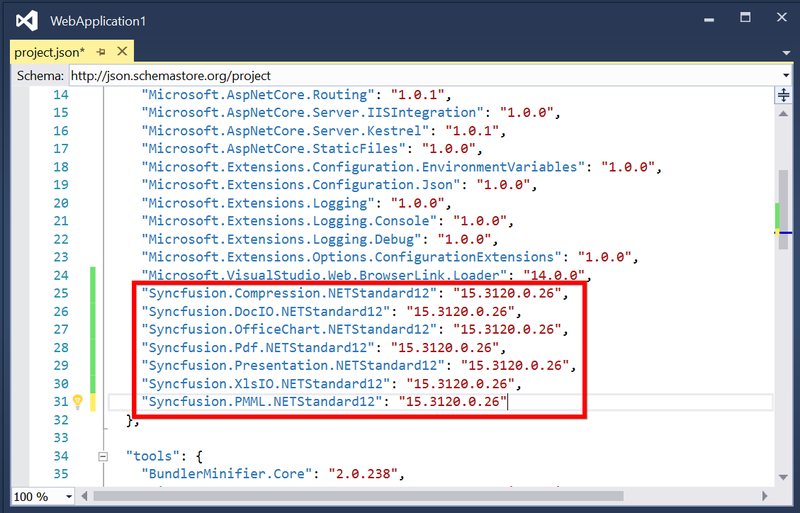 You can refer Installation procedure to configure Syncfusion NuGet packages. The File format component packages has been modified from Volume 3, 2017 (15.3.0.26) release. You can refer migration document for more details. Create a new folder in your local directory. Open the command prompt from your local directory with administrator mode. In the command prompt we have an options to develop a below listed types of projects. The default type as console application. If you want to create any other specific type project, need to specify the -t (template) key in command before the project type name. To know more about the project options and its syntax declarations refer the .NET link. Then run the below mentioned command to create a new web application. After command execution the project will be created within your folder. Open Visual Studio Code and open your ASP.NET folder using Open -> Folder menu. Now your project folder is loaded in Visual Studio Code application. Open your bower.json json file and specify our Syncfusion package will loads our scripts and CSS. Refer this link to configure the bower execution environment in your local machine. Then install a bower extension in your Visual Studio code to complete a configuration. 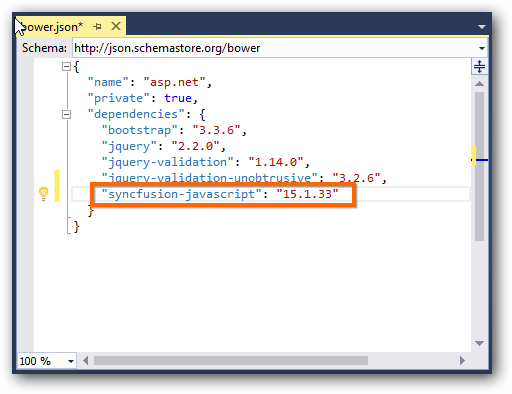 In bower.json file specify our Syncfusion packages with our latest version. Open quick window (Ctrl + p) to run the bower install command to install our scripts and CSS to your application wwwroot -> lib folder. Recommended to install the “Bower package watcher” extension will helps to load the packages whenever save the bower.json file. Now open your project.json file to specify our assembly packages. Open _viewimports.cshtml file from the views folder and add the following namespace for components references and Tag Helper support. open command prompt window with administrator rights and navigate to your project folder then execute the following command to restore the packages specified in your project.json file. Now refer the necessary scripts and CSS files in your _layout.cshtml page. Finally press F5 key to deploy your project. To create an ASP.NET Core 1.1.0 application, we will use the yeoman tool. This is a scaffolding tool for Modern web apps and helps us to quick start a new web project. Open the Command prompt window in Administrator mode and execute the below mentioned command to install the Yeoman tool in your local machine by using npm. After installing Yo you need to install the ASP.NET generator, gulp and Bower. Once Yeoman generator installed successfully, run the below command to invoke a ASP.NET Core project creation wizard. From the list of available projects, select the Web Application Basic [ without Membership and Authorization ] by using arrow keys. And then provide the project name or simply press the enter key to create the project with default name. Now configure a Bower execution environment in your local machine based on this link. 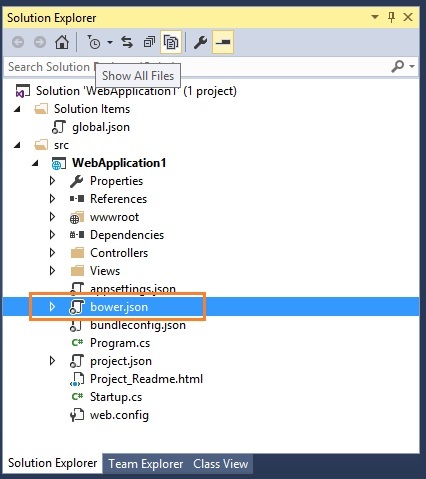 Then install a Bower extension in your Visual Studio code to complete a configuration. In bower.json file specify our Syncfusion packages with our latest version will loads our scripts and CSS. Open “_viewimports.cshtml” file from the views folder and add the following namespace for components references and Tag Helper support.